Everlast offers replacement of existing guttering and downpipes with a wide range of UPVC styles and colours, all fitted in accordance with manufacturer’s specification. We also offer all aspects of cast iron and aluminium gutters, downpipes and metal snow guards. We can supply an extensive section range of aluminium guttering and down pipes including, half round, Victorian OGEE and deep flow gutters. Everlast can also advise on bespoke gutters, designed and manufactured in aluminium to suit your specific project needs. UPVC fascias, soffits, and bargeboards supplied by leading manufacturers with a choice of many colours and profiles and provide a maintenance free solution. Timber fascias, soffits and bargeboards are still provided for a more traditional method to meet clients specific design requirements. Defective or ageing gutters can cause major leaks in buildings either through perished joints or simply where a steel gutter has corroded. Everlast’s expertise in the refurbishment market ensures the correct solution will be applied to alleviate specific problems. 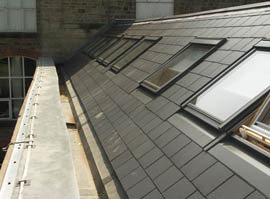 Valley and boundary gutters are often suitable for refurbishment mitigating the need for replacement, by installing a high performance ‘joint free’ lining system. Some gutters become overloaded during severe rain storms, resulting in major leaks. In most cases this problem can be resolved, by either increasing the capacity of the gutter, providing additional outlets or installing a siphonic system. At Everlast we have experienced staff at both design and delivery level to ensure that we advise you of the best solution, and provide a quality product that meets your needs.